The most recent study demonstrates that more than two-thirds of patients experienced a significant improvement in their symptoms and at least 45% of patients experienced complete remission of their symptoms at 12 months. Yes! 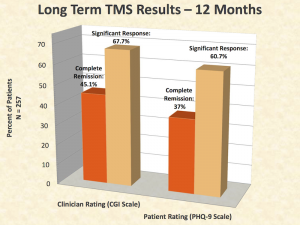 Data presented at the 2013 American Psychiatric Association shows that patients with Major Depressive Disorder who received TMS therapy achieved effective, meaningful response and remission which were maintained through one year of treatment. At the end of the anti depression treatments, 62% of patients experienced substantial improvement in their symptoms and 41% of patients achieved complete remission of their symptoms. 12 months later, 68% of patients reported substantial improvement of their symptoms and 45% achieved complete remission. What does a usual course of treatment involve? Because your TMS-certified physician needs to determine how to most effectively administer treatment, your first session could last up to an hour and a half. The physician will first perform a test to identify your motor threshold (“MT”). This test is important because it identifies and customizes the magnetic field strength that will be used in your treatment. Next, the TMS physician will determine the place on your head where the TMS treatment will be applied to receive optimal treatment and the magnetic coil will be moved to that location. Our TMS Specialist will then administer TMS therapy over an approximately 40-minute period. In 30-second intervals, the device will deliver rapid “pulse trains” of magnetic fields, similar to those produced by a magnetic resonance imaging (MRI) machine. These magnetic fields are precisely targeted at a key area of the brain known to be underactive in people who suffer from depression and other mood disorders; they only reach about 2-3 centimeters into the brain directly underneath the treatment coil. TMS therapy stimulates that area to restore it to normal function and lift the patient’s depression. For a patient, TMS therapy feels like a tapping on the scalp. Some patients may find this tapping uncomfortable and adjustments can be made to reduce this discomfort. Neurostar TMS therapy uses a technology similar to Magnetic Research Imaging (“MRI”), which has a long-term record of safety. Clinical trials have demonstrated the safety of NeuroStar TMS therapy in treating patients who have had an inadequate response to prior antidepressant medications. Over 10,000 active treatments were performed to demonstrate its safety during clinical trials. NeuroStar TMS therapy has very few side effects and is generally well tolerated by patients. The most common side effect reported during clinical trials was scalp discomfort—generally mild to moderate and occurring less frequently after the first week of treatment and or headaches. Fewer than 5% of patients discontinued treatment with NeuroStar TMS therapy due to side effects. Please check out our Patient Self Assessment tab on the left hand side of your screen. TMS therapy should be considered for patients who have failed to achieve satisfactory improvement in the current episode from one or more prior antidepressant drug regimens administered at or above the minimal effective dose and duration.